After not seeing each other for more than three weeks, Peggy and I just had to get together and go out for lunch this past Monday. That’s a long time to not see your BFF! The day before, I called her to make our lunch plans. Coincidentally, she was having lunch at Pita Jungle, enjoying Coconut Curried Soup w/ Chickpeas, with her daughter, Natalie. Peggy said, “Linda, I LOVE this soup! 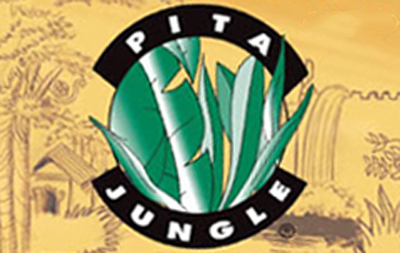 You have to taste it, figure out how to make it, and give me the recipe!” I told her that if she didn’t mind going back to Pita Jungle the next day – I’d do my best. 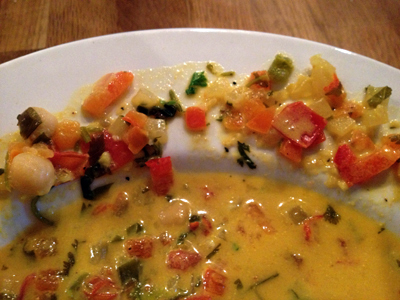 Problem is, the Coconut Curried Soup with Chickpeas is not on the printed or online menus at Pita Jungle. This means there is no description of the soup for me take any of my cues from. I’ve deciphered restaurant recipes many times before but there’s always been some sort of guide or reference, you know, a description of the dish – besides just the food itself. This was going to be more challenging than I had originally thought. Monday, I ordered the soup. I ordered nothing else, I wanted all my focus to be on the flavors of that soup. I tasted it and knew some of the ingredients for certain; obviously coconut milk, probably full fat. 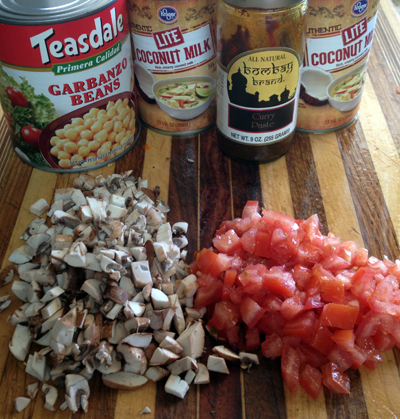 I’m going to use lite coconut milk for my recipe, feel free to use full fat if you’d rather. 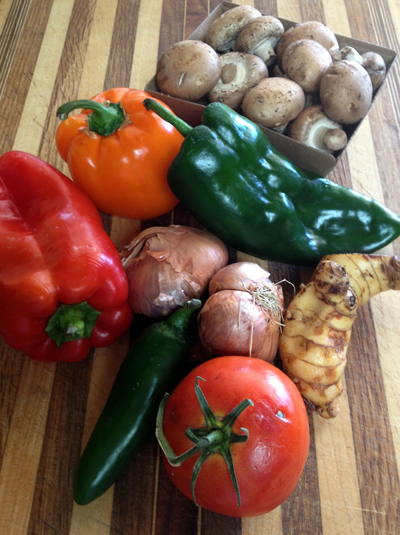 There was most certainly red curry paste, garlic, and ginger … and possibly jalapeño as well. 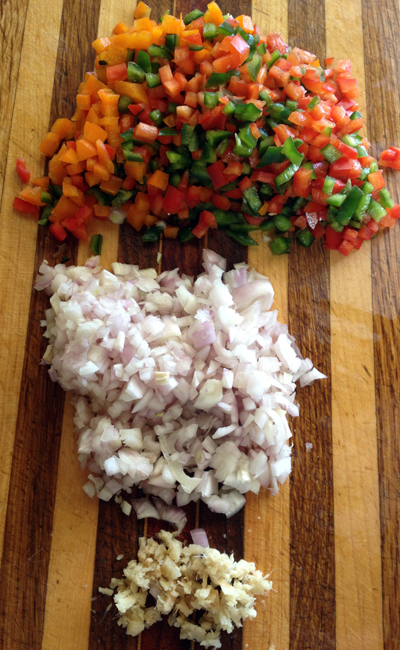 Next, I spread the vegetables out on the rim of the bowl to see what I could see; I snapped this photo of it – let’s see… red bell pepper, tomato, poblano pepper, parsley, chickpeas, onion, and either orange bell pepper or carrot. The orange-colored pieces were so small that neither Peggy nor I could decide which it was – so I’m going with orange bell pepper since I don’t care for carrots. I’m also adding diced mushrooms, just ’cause I want to. I’m posting the recipe this morning but I may come back and tweak it after Peggy gets over here and tries it. If tweaking is done, I’ll put any additions or changes in red print… stay tuned. Peggy never did make it over to try the soup, but my boys and I decided it was too thick. 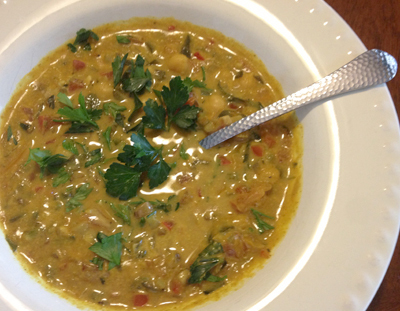 Add another can of coconut milk or vegetable broth to thin it out to your liking. I used more coconut milk and then needed to add more curry paste as well. I’ve made those changes in the recipe below. Heat a large saucepan or pot over medium high heat, add the olive oil and swirl the pot to coat the bottom with the oil. Add the red bell pepper, orange bell pepper, poblano pepper, shallot, jalapeño, garlic, and ginger; sauté until vegetables are tender, about 5 to 6 minutes. 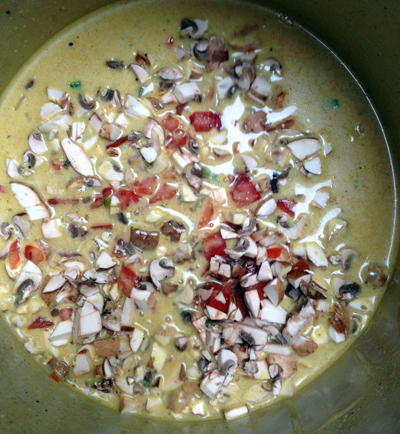 Add the coconut milk and 1 1/2 tablespoons of the curry paste. 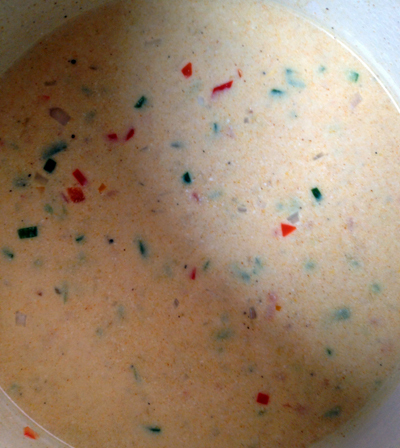 Stir well to blend and bring to a low simmer, cooking for 5 minutes. 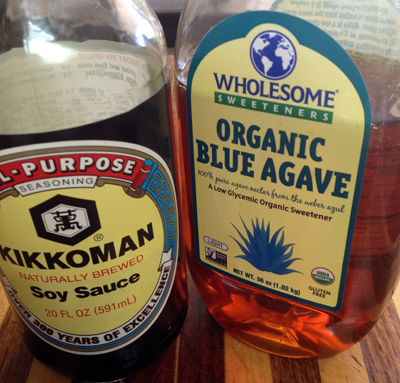 Add the soy sauce and agave nectar. Taste, adding more curry paste, if desired to spice it up. Stir in the tomato, mushrooms, and chickpeas; continue to simmer over medium-low heat for another 5 minutes. Taste again, adjusting seasonings to your liking. 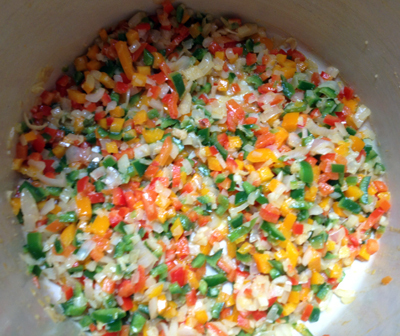 Add in the minced parsley, stir to combine. 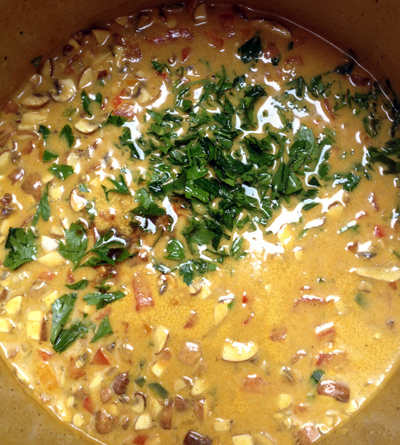 Thin with additional coconut milk or vegetable broth, to your liking. Taste again and add more curry paste, if needed. 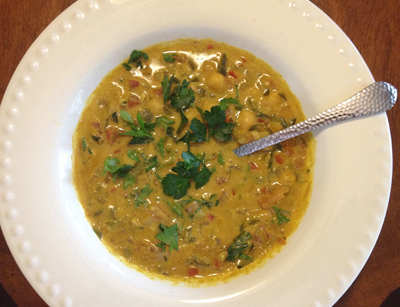 Ladle into flat bowls, garnish with more parsley, and serve. How about some Thai basil? I have a ton of it in my garden!! Thank you so much! I always order this soup when I go there and am excited to try your homemade version! Our waiter said it had cilantro. So I’m curious if it was cilantro or parsley. Hi Katie, It’s possible that they interchange the two, but 5 years ago when I did a copy-cat of this recipe, they were using parsley. Personally, I like cilantro more, so I’d happily go with that.